I CASED this beautiful card from Shannon Jaramillo. It looks so classy and is a very substantial card, my base being the extra thick Whisper White card stock. I used a print Pop of Pink Specialty Designer Series Paper. My favorite little accent is the Burlap Ribbon behind the Layering Ovals sentiment. Also, that large flourish from Flourish Thinlits pretty much make the card in one smooth move. Thank you, Shannon, for the inspiration! 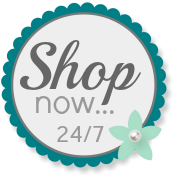 Please use my Online Store any time you wish to order your own Stampin' Up! products. Oh my gosh, I just made a sympathy card using that same die but haven't posted it yet. Yours is so pretty, love the black & white. Mine will be posted later today.